When you boot into FreeNAS®, the Console Setup, shown in Figure 3a, will appear at the end of the boot process. If you have access to the FreeNAS® system’s keyboard and monitor, this Console Setup menu can be used to administer the system should the administrative GUI become inaccessible. you can access the Console Setup menu from within the FreeNAS® GUI by typing /etc/netcli from Shell. You can disable the Console Setup menu by unchecking the “Enable Console Menu” in System ‣ Advanced. 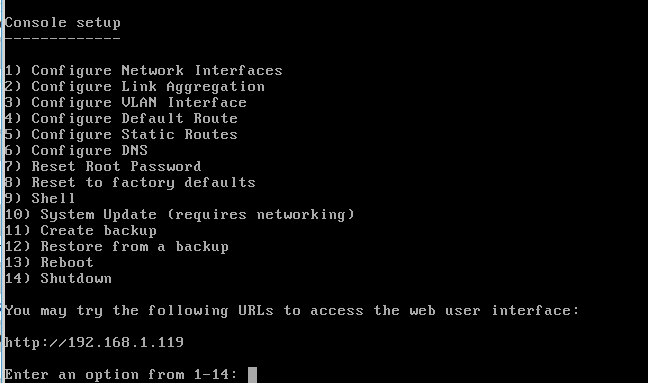 5) Configure Static Routes: will prompt for the destination network and the gateway IP address. Re-enter this option for each route you need to add. 6) Configure DNS: will prompt for the name of the DNS domain then the IP address of the first DNS server. To input multiple DNS servers, press Enter to input the next one. When finished, press Enter twice to leave this option. 7) Reset Root Password: if you are unable to login to the graphical administrative interface, select this option and follow the prompts to set the root password. 8) Reset to factory defaults: if you wish to delete all of the configuration changes made in the administrative GUI, select this option. Once the configuration is reset, the system will reboot. You will need to go to Storage ‣ Volumes ‣ Import Volume to re-import your volume. 9) Shell: enters a shell in order to run FreeBSD commands. To leave the shell, type exit. 10) System Update: if any system updates are available, they will automatically be downloaded and applied. The functionality is the same as described in Update, except that the updates will be applied immediately for the currently selected train and access to the GUI is not required. 11) Create backup: used to backup the FreeNAS® configuration and ZFS layout, and, optionally, the data, to a remote system over an encrypted connection. The only requirement for the remote system is that it has sufficient space to hold the backup and it is running an SSH server on port 22. The remote system does not have to be formatted with ZFS as the backup will be saved as a binary file. When this option is selected, it will prompt for the hostname or IP address of the remote system, the name of a user account on the remote system, the password for that user account, the full path to a directory on the remote system to save the backup, whether or not to also backup all of the data, whether or not to compress the data, and a confirmation to save the values, where “y” will start the backup, “n” will repeat the configuration, and “q” will quit the backup wizard. If you leave the password empty, key-based authentication will be used instead. This requires that the public key of the root user is stored in ~root/.ssh/authorized_keys on the remote system and that key should not be protected by a passphrase. Refer to Rsync over SSH Mode for instructions on how to generate a key pair. 12) Restore from a backup: if a backup has already been created using “11) Create backup” or System ‣ Advanced ‣ Backup, it can be restored using this option. Once selected, it will prompt for the hostname or IP address of the remote system holding the backup, the username that was used, the password (leave empty if key-based authentication was used), the full path of the remote directory storing the backup, and a confirmation that the values are correct, where “y” will start the restore, “n” will repeat the configuration, and “q” will quit the restore wizard. The restore will indicate if it could log into the remote system, find the backup, and indicate whether or not the backup contains data. It will then prompt to restore FreeNAS® from that backup. Note that if you press “y” to perform the restore, the system will be returned to the database configuration, ZFS layout, and optionally the data, at the point when the backup was created. The system will reboot once the restore is complete. the backup and restore options are meant for disaster recovery. If you restore a system, it will be returned to the point in time that the backup was created. If you select the option to save the data, any data created after the backup was made will be lost. If you do not select the option to save the data, the system will be recreated with the same ZFS layout, but with no data. the backup function IGNORES ENCRYPTED POOLS. Do not use it to backup systems with encrypted pools. During boot, FreeNAS® will automatically try to connect to a DHCP server from all live interfaces. If it successfully receives an IP address, it will display the IP address which can be used to access the graphical console. In the example seen in Figure 2.5b, the FreeNAS® system is accessible from http://10.2.1.115. If your FreeNAS® server is not connected to a network with a DHCP server, you can use the network configuration wizard to manually configure the interface as seen in Example 3a. In this example, the FreeNAS® system has one network interface (em0). 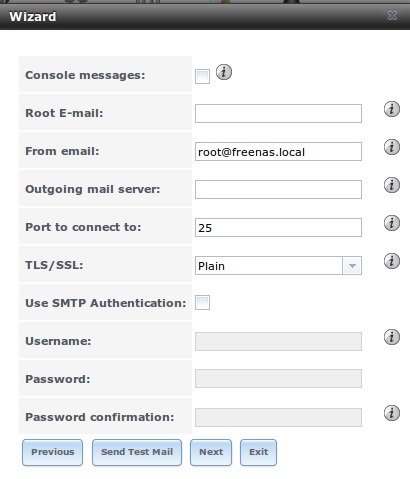 Once the system has an IP address, input that address into a graphical web browser from a computer capable of accessing the network containing the FreeNAS® system. You should be prompted to input the password for the root user, as seen in Figure 3b. Enter the password created during the installation. You should then see the administrative GUI as shown in the example in Figure 3c. Are proxy settings enabled in the browser configuration? If so, disable the settings and try connecting again. If the page does not load, make sure that you can ping the FreeNAS® system’s IP address. If the address is in a private IP address range, you will only be able to access the system from within the private network. If the user interface loads but is unresponsive or seems to be missing menu items, try using a different web browser. IE9 has known issues and will not display the graphical administrative interface correctly if compatibility mode is turned on. If you can’t access the GUI using Internet Explorer, use Firefox instead. If you receive “An error occurred!” messages when attempting to configure an item in the GUI, make sure that the browser is set to allow cookies from the FreeNAS® system. Beginning with FreeNAS® 9.3, a configuration wizard automatically starts the first time the FreeNAS® GUI is accessed. This wizard walks you through the steps needed to quickly configure FreeNAS® to start serving data over a network. This section describes these configuration steps. If you wish to use the wizard again after the initial configuration, click the “Wizard” icon. Figure 3.1a shows the initial wizard configuration screen. you can exit the wizard at any time by clicking the “Exit” button. However, exiting the wizard will not save any selections. You can always restart the wizard again by clicking the “Wizard” icon. Alternately, you can use the FreeNAS® GUI to configure the system, as described in the rest of this Guide. 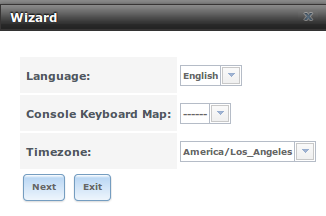 This screen can be used to change the default language, keyboard map, and timezone. After making your selections, click “Next”. The next screen depends on whether or not the storage disks have already been formatted into a ZFS pool. Figure 3.1b shows the configuration screen that appears if the storage disks have not yet been formatted. the initial configuration wizard will not recognize an encrypted ZFS pool. If your ZFS pool is GELI-encrypted, cancel the wizard and use the instructions in Importing an Encrypted Pool to import the encrypted volume. You can then rerun the wizard afterwards, if you wish to use it for post-configuration, and it will recognize that the volume has been imported and will not prompt to reformat the disks. Input a name for the ZFS pool that conforms to these naming conventions. It is recommended to choose a name that will stick out in the logs (e.g. not data or freenas). Next, decide if the pool should provide disk redundancy, and if so, which type. The ZFS Primer discusses RAIDZ redundancy in more detail. If you prefer to make a more complex configuration, click the “Exit” button to close the “Wizard” and instead use Volume Manager. Automatic: automatically creates a mirrored, RAIDZ1, or RAIDZ2 pool, depending upon the number of disks. If you prefer to control the type of redundancy, select one of the other options. RAID 10: creates a striped mirror and requires a minimum of 4 disks. RAIDZ2: requires a minimum of 4 disks. Up to 2 disks can fail without data loss. 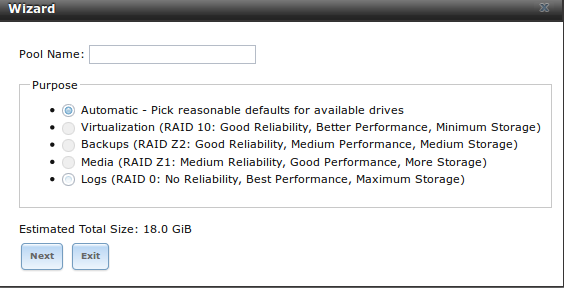 RAIDZ1: requires a minimum of 3 disks. Up to 1 disk can fail without data loss. Stripe: requires a minimum of 1 disk. Provides no redundancy, meaning if any of the disks in the stripe fails, all data in the stripe is lost. Once you have made your selection, click “Next” to continue. If the disks have already been formatted with ZFS and the disks have not been encrypted, the next screen will instead prompt to import the volume, as seen in Figure 3.1c. Select the existing volume from the drop-down menu and click “Next” to continue. The next screen in the wizard is shown in Figure 3.1d. If the FreeNAS® system is on a network that does not contain an Active Directory, LDAP, NIS, or NT4 server, click “Next” to skip to the next screen. 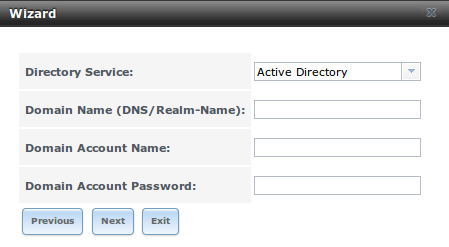 However, if the FreeNAS® system is on a network containing an Active Directory, LDAP, NIS, or NT4 server and you wish to import the users and groups from that server, select the type of directory service in the “Directory Service” drop-down menu. The rest of the fields in this screen will vary, depending upon which directory service is selected. Tables 3.1a to 3.1d summarize the available configuration options for each directory service. additional configuration options are available for each directory service. The wizard can be used to set the initial values required to connect to that directory service. You can then review the other available options in Directory Service to determine if additional configuration is required. The next configuration screen, shown in Figure 3.1e, can be used to create the network shares. FreeNAS® supports several types of shares for providing storage data to the clients in a network. 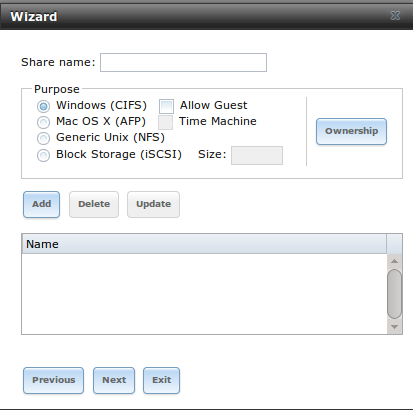 The initial wizard can be used to quickly make shares using default permissions which should “just work” for common scenarios. If you wish to configure more complex scenarios, refer to the section on Sharing. Windows (CIFS): this type of share can be accessed by any operating system using a CIFS client. Check the box for “Allow Guest” if users should not be prompted for a password in order to access the share. If you make any CIFS shares using the wizard, you can fine-tune them afterwards using Windows (CIFS) Shares. Mac OS X (AFP): this type of share can be accessed by Mac OS X users. Check the box for “Time Machine” if Mac users will be using the FreeNAS® system as a backup device. If you make any AFP shares using the wizard, you can fine-tune them afterwards using Apple (AFP) Shares. Generic Unix (NFS): this type of share can be accessed by any operating system using a NFS client. If you make any NFS shares using the wizard, you can fine-tune them afterwards using Unix (NFS) Shares. Block Storage (iSCSI): this type of share can be accessed by any operating system using iSCSI initiator software. Input the size of the block storage to create in the format 20G (for 20 GB). If you make any iSCSI shares using the wizard, you can fine-tune them afterwards using iSCSI. After selecting the “Purpose”, click the “Ownership” button to see the screen shown in Figure 3.1f. The default permissions for the share will be displayed. To create a user or group, input the desired name, then check the “Create User” box, to create that user, and the “Create Group” box, to create that group. Check or uncheck the boxes in the “Mode” section to set the initial access permissions for the share. When finished, click the “Return” button to return to the share creation screen. Click the “Add” button to finish creating that share, which will then appear in the “Name” frame. You can use the “Delete” button to remove the highlighted share in the “Name” frame. If you need to edit a share, highlight it, make the change, then press the “Update” button. When you are finished making shares, click the “Next” button to advance to the screen shown in Figure 3.1g. Console messages: check this box if you would like to view system messages at the bottom of the graphical administrative interface. This can be handy when troubleshooting a service that will not start. When using the console message view, if you click the console messages area, it will pop-up as a window, allowing you to scroll through the output and to copy its contents. Root E-mail: FreeNAS® provides an “Alert” icon in the upper right corner to provide a visual indication of events that warrant administrative attention. The alert system automatically emails the root user account whenever an alert is issued. It is important to input the email address of the person to receive these alerts and other administrative emails. The rest of the email settings in this screen should also be reviewed and edited as necessary. Before leaving this screen, click the “Send Test Mail” button to ensure that email notifications are working correctly. From email: the from email address to use when sending email notifications. Outgoing mail server: hostname or IP address of SMTP server. Port to connect to: port number used by the SMTP server. TLS/SSL: encryption type used by the SMTP server. Use SMTP Authentication: check this box if the SMTP server requires authentication. Username: input the username if the SMTP server requires authentication. Password: input the password if the SMTP server requires authentication. When finished, click “Next”. A message will indicate that the wizard is now ready to perform all of the saved actions. If you wish to make any changes, click the “Return to Wizard” button to review your edits. If you click the “Exit without saving” button, none of your selections will be saved. To save your edits, click the “Confirm” button. A status bar will indicate when the wizard has completed applying your settings. In addition to the settings that you specify, the wizard will automatically enable S.M.A.R.T. Tests, create a boot environment, and add the new boot environment to the boot menu. If you also wish to save a backup of the configuration database to the system being used to access the administrative graphical interface, go to System ‣ General, click the “Save Config” button, and browse to the directory to save the configuration to. It is recommended to always backup your configuration after making any configuration changes. The rest of this Guide describes the FreeNAS® graphical interface in more detail. The layout of this Guide follows the order of the menu items in the tree located in the left frame of the graphical interface. it is important to use the GUI (or the Console Setup menu) for all configuration changes. 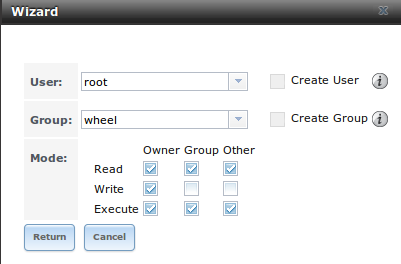 FreeNAS® uses a configuration database to store its settings. While it is possible to use the command line to modify your configuration, changes made at the command line are not written to the configuration database. This means that any changes made at the command line will not persist after a reboot and will be overwritten by the values in the configuration database during an upgrade.